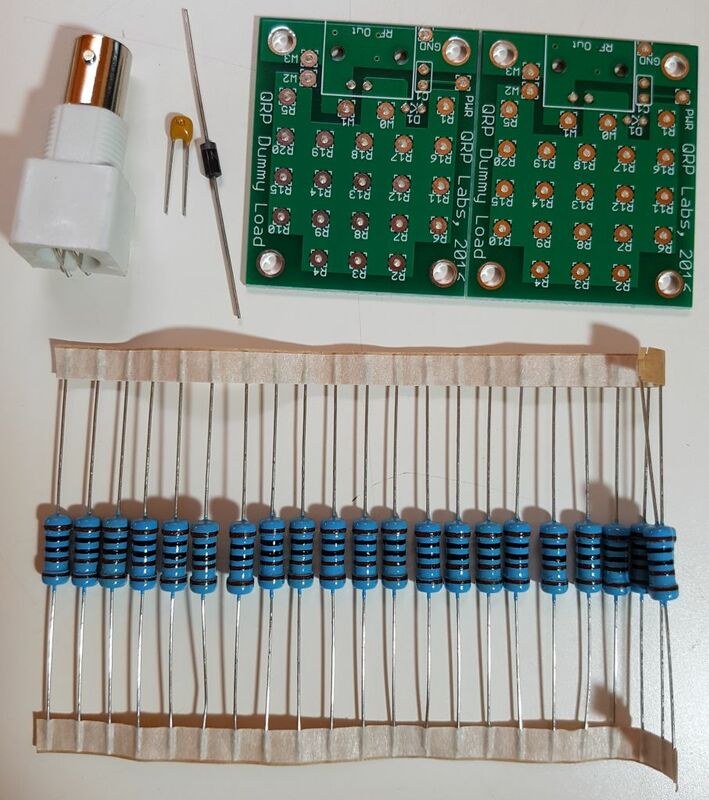 A useful shack accessory, this is a simple 50-ohm 20W dummy load kit using 20 individual 1K resistors in parallel. Additionally this kit has a diode-capacitor rectifier for detecting the peak voltage of the RF waveform, which may be measured using a DVM. 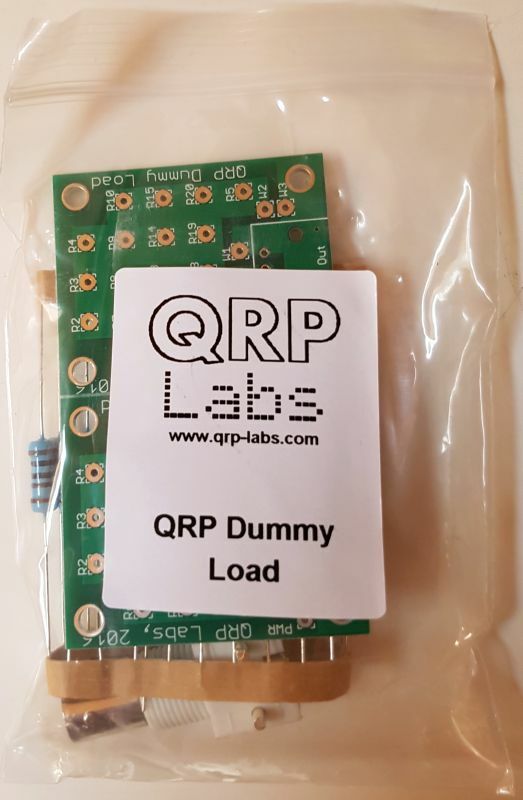 The dummy load kit comes with 20 1K 1% 1W resistors, a diode-capacitor rectifier for peak voltage readings using a DVM, and a BNC connector. There are two identical PCBs, and the resistors are sandwiched between them to minimise stray inductance. The PCB size is 1.7 x 1.4 inches (43 x 36mm). The sandwiched-together assembly is about 0.6 inches (15mm) thick. Please note that the BNC connector is threaded but no mounting nut is included. CLICK HERE to download the kit-building instructions for the dummy load kit. CLICK HERE to download the FRENCH translation of the assembly instructions (thanks Michel ON4LAU for this!). CLICK HERE to download the ZCECH language translation of the assembly instructions (thanks Ladislav OK1LO for this!). This is a simple and inexpensive peak voltage detector and you should not expect amazing accuracy from it. However it can give a useful indication of output power, and even a reasonably accurate one if you calibrate it using a known accurate power meter. The following measurements were made on one kit (as constructed for the assembly manual photography) and power output 0.8mW to 10W. The power measurement was made using the peak-to-peak measurement function of a 100MHz digital oscilloscope. The DVM used was an inexpensive common yellow plastic few-$ type. The two graphs below show the same data, but the second graph (blue line) is zoomed in to show the very low power region 1-400mW. 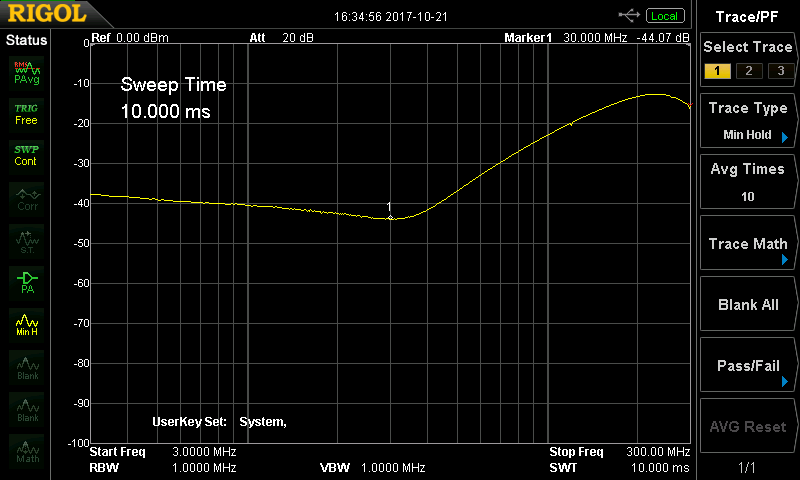 This return loss plot by Jim K8IQY shows good performance from 3 to 300MHz. Thanks Jim! 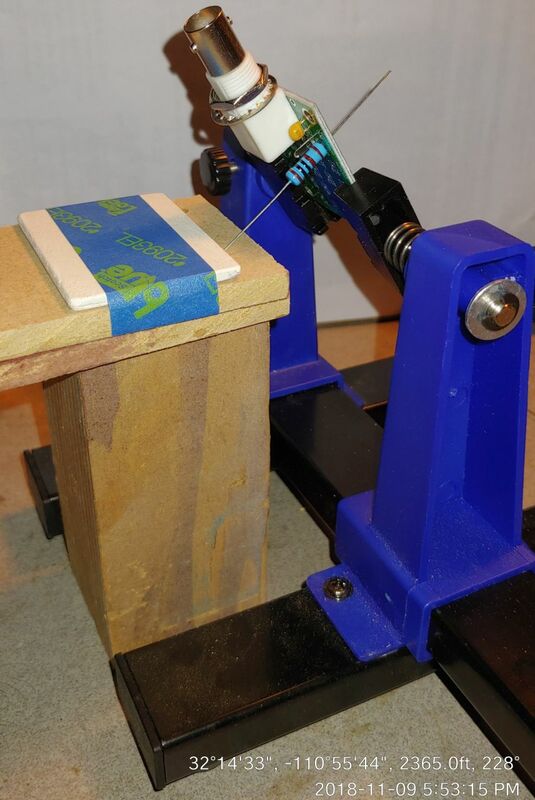 This is Curt's method for holding the resistors vertical (i.e. perpendicular to the board) during soldering.